Prince Adeyeye Enitan Adewusi was Born to Prince Ropo and Late Mrs Margaret Wuraola Ogunwusi of Ile Opa family compound, Ile Ife. 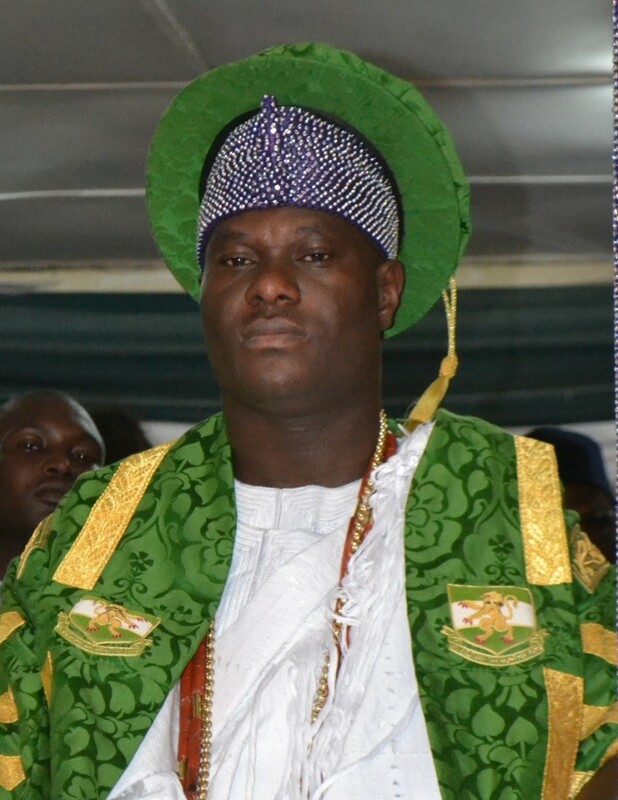 He is 51st Ooni of Ife. He took over from Oba Sijuwade who died on July 28, 2015 in a London Hospital. Mr. Ogunwusi is a graduate of Accountancy and a certified member of the Institute of Chartered Accountants of Nigeria and of the Institute of Management. He has been involved in engineering, procurement and construction (EPC) contracts locally and abroad for over 11 years. To become Ooni, Prince Ogunwusi defeated 20 other contenders, including his 48-year old real estate- magnate brother, Adetunji, the Group Chairman of Primewaterview Holdings (comprising of Primewaterview Limited and PWV Management Services). He is on the Board of Imperial Homes Mortgage Bank Limited, (formerly GTHomes), GTBank Plc and FinaTrust Microfinance Bank Limited. He is a member of several professional bodies including ; Institute of Chartered Accountants of Nigeria (ICAN), an Associate Accounting Technician and a certified member of the Institute of Directors (IoD) Nigeria as well as Global Real Estate Institute (GRI). It is worthy to note that since the demise of Oba Okunade Sijuwade, the Olubuse II, who in his capacity as the Oonirisa of the source brought a lot of fanfare and prestige to the already well revered stool which was once occupied by such illustrious personalities as Oduduwa and Oranmiyan, the race for the next Ooni was between the four ruling families; Osinkola, Ogboru, Giesi and Lafogido. Prince Adeyeye Enitan Ogunwusi, who was born into the Giesi Ruling House, Ojaja Royal Compound of Agbedegbede in Ile-Ife is an astute entrepreneur, driven by turning impossibilities to possibilities. His power of imagination has set him aside, revolutionizing his approach to creativity and innovation. He is a distinct achiever, with the conscience of youthful excellence, his ambition is exceptional with savvy business ideas, making a mark in his immediate society and beyond. Prince Ogunwusi’s excellence and outstanding acumen would soon start to announce itself for the world to behold. Prince Adeyeye’s appointment was announced in a press statement by the Government of Osun state in a statement signed by the Secretary to the State Government, Alhaji Moshood Adeoti On October 24, 2015. Prince Adeyeye Enitan Ogunwusi attended Sobuola Memorial Nursery and primary school, Ibadan and completed his primary school education at Ibadan District Council (IDC), Akobo, Ibadan. He then attended the prestigious Loyola College, Ibadan in 1985, led by Reverend G.B Daramola, the principal of the college. He later proceeded to Ile Ife at Saint Peter’s Secondary School, Omi Okun, Ile Ife led by Late Johnson Adebisi. He holds a Higher National Diploma in Accountancy from the Polytechnic Ibadan, where he started cutting his teeth in outstanding entrepreneurship, even as a student. To mention a few, the royal prince of Ile-Ife (the source) is a member of some dignified professional bodies namely; Institute of Chartered Accountants of Nigeria (ICAN), an Associate Accounting Technician and a certified member of the Institute of Directors (IOD) Nigeria. He is also an active member of the Global Real Estate Institute (GRI) having participated at various levels. He is married to Adedokun Adebisi Ogunwusi and blessed with a daughter, Adeola Aanuoluwapo Ogunwusi. To be a Prince in Yoruba land in itself is outstanding. However, to be a prince of the source, Ile-Ife, the Cradle of Civilizations is to be truly blue-blooded. The young Prince is very passionate about what he believes in; people and possibilities and thus has achieved giant stride from his very youthful age. Prince Adeyeye Enitan Ogunwusi over the years has fostered numerous remarkable partnerships with dignified Royal Fathers of Lagos(Yoruba Land) in some of his Real Estate developments; HRM Oba Saheed Elegushi, Kusenla III, Elegushi of Ikate Land, Lagos(Development of Lake View Park 2, Lafaji, Off Orchid Hotel Road, Lekki-Epe expressway), HRM the Ooni of Ife, Oba Okunade Sijuwade, (development of Northpointe Estate, Chevron Drive, Lekki, Lagos), HRM Oba Oyekan, Onilado of Ilado-lnagbe Island, Lagos(Development of Inagbe Grand Resorts and leisure, Lagos), HRM Oba Adedapo Tejuoso, The Oranmiyan Osile Oke Ona of Egba Land, Abeokuta (development of the Lord’s Estate, Buckswood College Abeokuta), HRM Oba Oloruntoyin Saliu, The Oloworo of Oworonsoki, Lagos (partners in the proposed Oworonsoki Redevelopment Scheme, Lagos), HRM Oba Akinloye, Ojomu of Ajiran Land, Lekki – a host to several developments which Prince Adeyeye has embarked on. HRM Olofa, Oba Mufutau Muhammed Gbadamosi (partnership during the rice and sugar merchandising for Dangote Group and others). Prince Adeyeye Enitan Ogunwusi is indeed a highly dignified man, fearless and daring, a self-made man who not only has passion for his home town but for his country as a whole. He has forged respectable alliances with some of the most esteemed Royal fathers, leaders and kings of our time. It is without doubt that the young prince of Ile –Ife through his vision to impact the lives of everyone around him and his fervent passion for humanity has broken grounds as an investor in people and a preservationist of the cultural heritage of Ile-Ife. He is loved and highly admired by the people of Ile-Ife and importantly, he remains in tune with his roots and tradition.